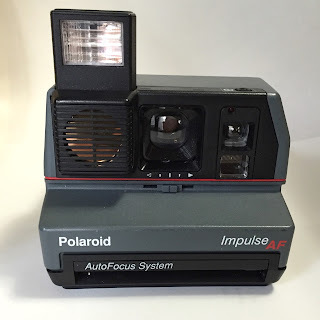 I purchased a Polaroid Impulse AF a few weeks ago at a local Goodwill Outlet. I go there a couple of times a month and just dig through the blue bins to see if anyone has donated old film cameras. Occasionally I'll find something. If I do, then it's normally just old film point and shoots. On a good day I'll find a Polaroid like this Impulse. The Impulse is cool because it has an autofocus function. I used the Impulse AF during my last 2 model shoots. 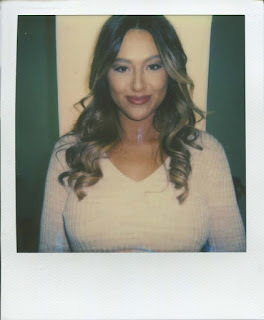 I used a pack of The Impossible Project 600 Color during the 2 shoots. The quality is OK for an old Polaroid. On both shoots the lighting in the studio was somewhat poor / low so the images were a bit dark. Not 100% sure the flash fired, but I'm guessing it did. I just need to learn how to balance the lighting in the studio with the light slider under the lens. Here is a shot from yesterday's maternity shoot with a model Cecilia Hernandez who I've worked with several times. A bit darker than I'd like but still cool. Next time with this camera I'm going to use it outside. I'll see how it it works.